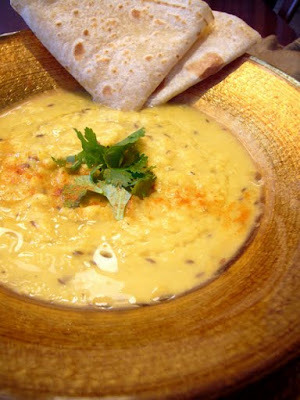 There are probably as many recipes for dal out there on the internet as there are food blogs. This recipe of mine is a favorite, not only because it is delicious but it is an easy to make dish that is really good for you. In the never ending quest to mind my waistline I find myself eating a lot this stuff. It also plates up beautifully with its swirl of spiced tempering oil and a little fresh cilantro. Wash and pick over the lentils and add to a pot with the salt, turmeric and water and bring to a boil. Reduce heat and simmer, skimming the surface well. Cook for 15-20 minutes until lentils are soft, adding more water if necessary. Remove a cup of the lentils and puree with a fork or food processor and add them to thicken the soup. For the tempering oil heat the oil to about medium-medium high in a skillet and add the cumin seeds and saute until they darken slightly. Add the dried red chilies and cook for a minute more. Then add the ginger, green chilies, garlic and asafetida and saute briefly to cook the garlic. Remove the oil from heat and add the cayenne. Add half of the oil to the dal along with half the cilantro and the lemon juice. Taste for salt and additional cayenne. Plate the dal with the remaining cilantro and tempering oil on top. Serve with bread and/or basmati rice.